The Playhouse Company is bringing back Handel’s Messiah for an Easter Sunday matinee performance on April 1 at 15h00. 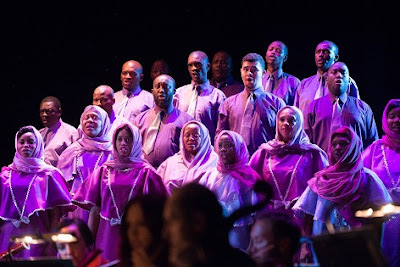 Directed by theatre luminary Ralph Lawson, the Company’s grandly staged production in Durban’s Opera Theatre features popular soloists, Khumbuzile Dhlamini (soprano), Violina Anguelov (mezzo), Thabiso Masemene (tenor) and Aubrey Lodewyk (baritone), with the 40-strong Playhouse Chorale and members of the KZN Philharmonic Orchestra, performing under the baton of English conductor, Tim Murray. Director Ralph Lawson shares his thoughts about this staging of the great work, which has become the world’s most frequently performed choral masterpiece since it was performed in Dublin in April 1742. “It's wonderful to have the opportunity to work on a semi-staged version of Messiah, a work of genius that, on every hearing of it (even at rehearsal), bestows a glow of marvellous well-being. The thing that appeals to me most about the work and which I'm trying to bring out in the staging of it, is Handel's humanity, which really infuses the work and makes a version like this possible. “He was, we are told, profoundly generous and donated regularly to retired musicians, to orphans and to the ill. He gave some of the proceeds from the debut performance to a debtors' prison and a hospital in Dublin. His annual benefit concerts always included Messiah and proceeds went to his favourite charity, a home for abandoned children called the Foundling Hospital in London. And he left the bulk of his considerable estate to charity and to his servants. “This quality imbues the work, and, in directing it, I've sought to bring it out through the singers’ approach to the text - in other words, to get them to engage emotionally with it rather than reproduce it somewhat technically as they might do in a conventional oratorio performance. For unlike his great contemporary, Bach, whose oratorios exalted God, Handel wrote about human beings' response to God. In this way he can really lift the spirits, because he is writing about human beings for human beings. Small wonder that Beethoven considered Handel ‘the greatest composer that ever lived. “It's really inspiring to work hand-in-hand with our conductor, Tim Murray, who is a Baroque music performance expert. He and I see eye to eye about a number of things pertinent to the work - in this case a fusion of what is known as ‘historically informed’ detail with the strength and unique quality of our local voices. A lot of the musical dynamics of the piece are later additions by editors and we're stripping these away to get back to basics and ‘real’ meaning. Joining the conversation, conductor Tim Murray adds: “One of my formative musical experiences as a boy chorister was singing Messiah on tour in Holland with the Hannover Band, conductor Roy Goodman and a wonderful group of soloists. It was the late 1980s, and the historically informed style, on original instruments, was long-established, yet in the context of an old-fashioned British choir school it still had a somewhat radical edge. I will never forget the sound of those performances: so fresh, vibrant and alive. Cobwebs well and truly blown away. One of the high points of Western music, Handel’s Messiah score abounds with a wealth of evergreen choral items. Among these are the magnificent Hallelujah Chorus, along with equally splendid numbers such as For Unto Us A Child Is Born, And The Glory of the Lord and many more, as well as benchmark solos such as Every Valley, He Was Despised, I Know That My Redeemer Liveth, O Thou That Tellest Good Tidings To Zion, Rejoice Greatly, O Daughter of Zion, The Trumpet Shall Sound and Why Do The Nations So Furiously Rage Together, to name but a few. Messiah takes place at 15h00 on April 1 in the Playhouse Opera. Booking is through Computicket outlets nationwide. Tickets from R110 and R130. Call 0861 915 8000 or book online at www.computicket.com. Alternatively call Playhouse Box Office on 031 369 9540 (office hours).